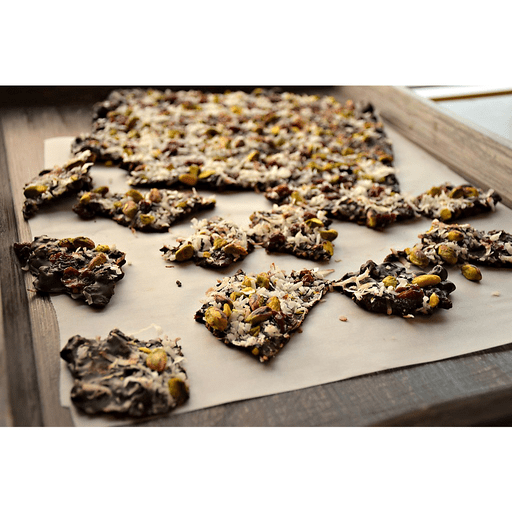 With rich dark chocolate, sweet dried cherries and crunchy pistachios, this decadent bark is sure to satisfy any sweet tooth. 1. Line the bottom and sides of a jelly-roll pan or baking sheet with foil, taking care to avoid wrinkles. 1. Toss pistachios with cherries and coconut in a medium bowl. Divide the mixture in half. Stir orange zest into 1 portion. 1. Melt chocolate in a double boiler over hot water. (Alternatively, microwave on low in 30-second bursts.) Stir often with a rubber spatula so it melts evenly. 1. Remove the top pan and wipe dry (or remove the bowl from the microwave). Add the pistachio mixture containing the orange zest to the chocolate and stir to mix well. Working quickly, scrape the chocolate onto the prepared pan, spreading it to an even ¼-inch thickness with a rubber spatula. Sprinkle the remaining pistachio mixture on top nad gently press it into the chocolate with your fingertips. Refrigerate, uncovered, just until set, about 20 minutes. 1. Invert the pan onto a large cutting board. Remove the pan and peel off the foil. Using the tip of a sharp knife, score the chocolate lengthwise with 6 parallel lines. Break bark along the score lines. Break the strips of bark into 2- to 3-inch chunks. This chocolate bark is also delicious topped with dried cranberries instead of dried cherries! For dairy free or vegan: Use Enjoy Life® Dark Chocolate Morsels in place of bittersweet chocolate. Calories 190, Total Fat 11g (Saturated 8g, Trans 0g), Cholesterol 0mg, Sodium 40mg, Total Carbohydrate 25g (Dietary Fiber 1g, Sugars 19g), Protein 1g, Vitamin A 4%, Vitamin C 2%, Calcium 0%, Iron 2% *Nutritional values are an approximation. Actual nutritional values may vary due to preparation techniques, variations related to suppliers, regional and seasonal differences, or rounding.